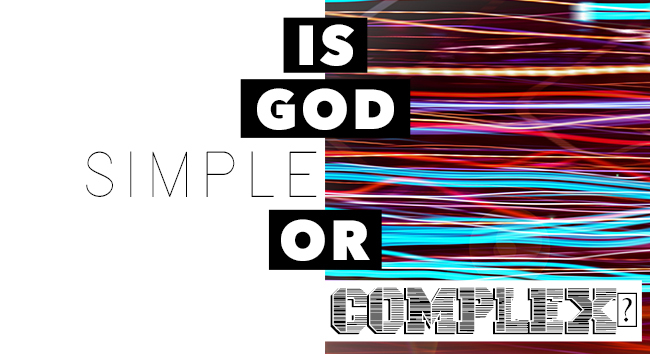 Media > Reasonable Faith Podcast > Is God Simple or Complex? KEVIN HARRIS: Well, it’s not a simple topic, but it is a fascinating one! Talking about divine simplicity. Dr. Craig, why don’t you tell us a little bit about this panel discussion that you were a part of on this topic, and then spell out some of the things we need to know about divine simplicity. DR. CRAIG: This was a session organized by the Evangelical Philosophical Society at the annual meeting of the American Academy of Religion. The American Academy of Religion is a professional society for teachers of religious studies at secular universities and divinity schools as well. The sessions at the AAR are so wide-ranging. It is everything from Buddhist studies to Native American religions to Tibetan studies to lesbian and queer perspectives on various things. It is all over the map. In an effort to bear witness to Christ in this sometimes dark environment, the EPS holds sessions at the AAR. This was one that was organized on divine simplicity. It featured a panel of both proponents and critics of the doctrine of divine simplicity. On the side supporting divine simplicity was Richard Howe and Brian Huffling, both of Southern Evangelical Seminary. The critics included Stephen Davis from Claremont McKenna and then myself. KEVIN HARRIS: Let's talk a little bit about what divine simplicity would entail. DR. CRAIG: What was at issue here is a very, very strong doctrine of divine simplicity that is expounded by Thomists – that is to say, those who are followers of Thomas Aquinas. The doctrine of divine simplicity lies at the very heart of Thomism, and that's why those who are Thomists are so ardently committed to this doctrine. For those of us who are not Thomists, the doctrine of divine simplicity is a sort of curiosity – an arcane vestige of a certain theology of the past that is not really all that relevant or important. So I just can't get exercised about this doctrine. But for Thomists, this is absolutely essential. Southern Evangelical Seminary is committed to Thomism. This seminary was started by Norman Geisler who is a Protestant Thomist, and they still carry on that legacy of a doctrinaire commitment to Thomism. What Thomism holds is that things are metaphysically composed of an essence which would be the properties that serve to define what a thing is. For example, if I were to say “What is a horse?” or “What is a chair?” you would then list the defining properties that make a thing a horse or that make it a chair. On Thomism everything that exists has an essence that defines what it is. But simply having an essence doesn't make the thing exist. For example, there's presumably a unicorn essence – if anything has these properties of being a unicorn then it would be a unicorn. But that doesn't mean that unicorns exist. In order for an essence to be instantiated in reality there needs to be an act of being or an act of existence conjoined with that essence in order to produce an actually existing thing. The claim is that this conjunction of an essence with an act of being requires a cause. The essence can't cause itself to exist because that's just purely theoretical. It has no being – right? – until the act of being is conjoined with it. So the essence can't cause the thing to exist. It can't cause itself to exist because it doesn't exist until it has the act of being conjoined to its essence. So for anything composed of essence and existence there needs to be an external cause. And if that thing is conjoined of essence and existence then it will need a further cause. Aquinas would say these causes of being can't go on to infinity. KEVIN HARRIS: It would be a vicious infinite regress. DR. CRAIG: Yes, that's right. And nothing would exist. You've got to get to a being which is not composed of essence and existence and therefore doesn't need a cause. For this being, its essence just is the act of existence or the act of being. It is the act of being itself subsisting in a necessary uncaused way, and that would therefore be perfectly simple. It would have no composition. There's no composition of essence and existence. It doesn't have a plurality of properties. It is just the pure act of being which is absolutely simple. That’s what the Thomistic doctrine of simplicity comes down to – that God just is the pure act of being without any kind of metaphysical complexity or composition. I've tried to explain that as best I can. It is a very difficult doctrine, indeed one that I think may be unintelligible, but that's the claim. KEVIN HARRIS: You hear little pithy sayings like “God has no parts with which he can part” and things like that. God is not composed of something. He's absolutely simple. DR. CRAIG: Yes. There are more modest doctrines of divine simplicity. For example, that God is not composed of separable parts. I would affirm that. But the Thomistic doctrine – which is where the interest today really lies. People who aren't Thomists don't have much interest in affirming this doctrine because it's not a biblical doctrine. But if you're a Thomist then you're committed to this view of God and so you've got to go to the mat in defense of it or Thomism will be sacrificed. KEVIN HARRIS: Let me see if I can give a couple of illustrations and ask you about them. For example, the Mormons have this ascended God who was once a man, and so he is composed of atoms and of cells and hair and teeth glorified somehow. That would not be a simple being. DR. CRAIG: Obviously not! That would be a gross complex being that is composed of physical parts. KEVIN HARRIS: If God is immaterial, could God still be composed of various immaterial things? DR. CRAIG: Well, he could have different properties. For example, even though God would be a purely spiritual substance and not composed of physical parts, nevertheless he could have the property of omniscience and the property of omnipotence and the property of holiness or goodness. These aren't the same properties. To be omniscient is obviously not to be good. To be omnipotent is not the same as to be eternal. So there could be a plurality or multiplicity of properties that God would have. Therefore there would be composition in that sense. I find that sense unobjectionable. But the Thomist can't even allow that. KEVIN HARRIS: How do they allow the Trinity? DR. CRAIG: That’s a huge problem for Thomists. Even on Aquinas’ own strange view of the Trinity where he thinks of the persons of the Trinity (and this is going to sound unintelligible again to our listeners, and it may be unintelligible) not as self-conscious subjects but as subsistent relations. The Father is like the subject of the relation and the Father wills and loves himself, and the Son is the Father as loved and known by himself. He is sort of like “me” in relation to “I.” I can objectify myself and think of myself, and so I have “I” who is the subject and then “me” who is the object. It’s at most that that Thomism gives you distinct persons in the Godhead – just the sort of difference between I and me, which I think is just completely inadequate for a robust doctrine of the Trinity. But set that aside. Leave that aside. Even on the face of it, given Thomas' view of the Trinity and the Trinitarian persons as subsistent relations, it's still hard to see how this is reconciled with divine simplicity because it would imply that there are relations within God. That there's a multiplicity of relations and the relation of paternity that the Father has to the Son is not the same relation that the Son has to the Father or that the Father has to the Holy Spirit! So even on his own terms, it's very difficult to see how Aquinas’ doctrine of divine simplicity is reconcilable with the doctrine of the Trinity. KEVIN HARRIS: I just want to encourage listeners that one place they can look is yours and J. P. Moreland's Philosophical Foundations textbook where you spell out a lot of these issues with divine simplicity. People can certainly read that chapter. DR. CRAIG: Yes, that would be in the chapters on the attributes of God or the coherence of theism where we look at these principle attributes of God and see if a philosophically coherent statement of these doctrines can be crafted. KEVIN HARRIS: I find God's simplicity very appealing when it comes to things like how he can transcend space and time and things like that. I know that you've defended at least some kind of divine simplicity when answering objections to infinite regress and God's timelessness and things like that. DR. CRAIG: And particularly against Richard Dawkins’ claim that postulating a divine designer is to postulate an entity that is just as complex as the universe itself and so doesn't make any advance in simplicity. What I point out is the same point you made with respect to the Mormons. Postulating an immaterial spiritual entity which is not composed of physical parts most definitely represents an enormous advance in simplicity over the postulation of a physical universe that is composed of parts and is characterized by a multiplicity of constants and quantities that are finely tuned for the existence of life. KEVIN HARRIS: Stephen Davis' talk at this panel was “Why Simplicity is Unnecessary.” So he just sees it as not a necessary doctrine. DR. CRAIG: Right. He wasn't so much constrained to refute the doctrine – that was more my task – as to just say we don't need this. A biblical view of God will affirm things like God's necessity and his aseity, but that these don't entail simplicity in the Thomistic sense, and I think he's quite right in that respect. KEVIN HARRIS: Overall, we can also encourage listeners to go to YouTube and can see each panel discussion as each one of you presented the paper. DR. CRAIG: Yes. This was video-recorded by Michael Lepien, and is now on Facebook so you can see all of the papers as they are presented and then the discussion afterwards which, as you can imagine, was very lively indeed. KEVIN HARRIS: It’s very simple! Just go to our Facebook page!